The home run deep to center. the hole in one at golf. the 80 yard touchdown pass. any other bad shot except it went good, if you cant back it with more. Even a blind hog finds a acorn now and then. A called X is sweet. Six on one target at 50 is my record. I put those types of targets up where I will see them frequently as positive reinforcement. A good beginning to a great match! Like biting into a York Peppermint Patty? While shooting an x at any distance is just great, I just can't figure out how some folks shoot a clean in rapid fire with a hardball gun. I happens, but wow, that's an accomplishment! 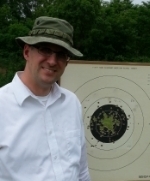 Yesterday I shot my 38/1911 SF, at the B16 in our organized BE practice. First shot was a liner X. I shot 4 more, all the while looking, and stopped. I realized I was way over my head with 50-2X. Is this like a grand Slam, Jack? An X at 25y is like finding a 100 rounds of .22 on the self at normal pricing. An X at 50y is like having your 3 year old son accidentally finding 3 boxes of 325 count .22s, hidden on a bottom shelf, after yelling at him for moving the shelf price tags around.....True story. scrum derringer wrote: An X at 25y is like finding a 100 rounds of .22 on the self at normal pricing. I hope that boy got some ice cream on the way home! A called X is a smile on the face and the feeling that at that moment, all is is just right with the world. Dot settles-trigger moves-uh oh-so does dot-dang!-bad shot-check scope-just like I thought-a dead center X !!! Colt711 wrote: Dot settles-trigger moves-uh oh-so does dot-dang!-bad shot-check scope-just like I thought-a dead center X !!! I have to figure out how to turn off my head when that happens. I cannot tell you haw many times my first round was a called 10 or X and the next was an 8...or worse. It all happens in the six inch space behind the rear site.